¡Hola! Welcome to our community. Spanish music and movement for parents, babies and toddlers 6 months - 2.5 years. Spanish for children aged 2.5 - 5 years and parents. Spanish for children aged 5 - 10 years and parents (not mandatory). For children 5 years + to adults. Have lessons tailored to you/your child’s interests and the flexibility to learn at a time that suits you. For children aged 2.5 - 5 years. Four to five hour session blocks to interact with other children in a Spanish-focused home environment. For families who prefer to learn from home in an unstructured, play-based environment. Opportunities to learn with other families too! More ways to connect and learn in your local community. Your connection with the wider Spanish community, plus tools to keep learning authentic and fun. “Spanish is awesome. We love the singing and activites in a fun learning environment. Mum has learnt at our pace as well. We have been taking our daughter to Chiquimundo's since she was six months old. She loves it, and her first word was in Spanish, of course! As her daddy is from Argentina and his parents don't speak English (and I don't speak Spanish), we want to make sure she is exposed to enough Spanish so she will become bilingual. Megan is amazing and we intend to keep Lark in classes for as long as possible. Highly recommended! This is my son's favourite extra activity. We have been doing the babies and toddler class for about three terms now, and it’s really lovely to see how much he enjoys the music and games, and also talks regularly about the other kids in the class. He understands a lot of the songs and phrases, and while not speaking much other than Aqui just yet, he does know all the actions and when to hide and come out from hiding places. Chiquimundo is a made-up word that can be broken into two parts: ‘Chiqui’ comes from ‘chico’ and means small, ‘mundo’ means world. Put these together and you have Chiquimundo = small world. The name represents what we offer perfectly. Through learning another language, such as Spanish, the world does become a smaller place. By learning Spanish, the doors open wide for you to travel to 21 countries! But more than this, learning with our various programmes means you and your children will have more connections with the wider Spanish community, with other learners, with the Spanish language and with each other! We’ve recently launched our ‘5 monitos’ to represent the 5 fundamental principles to language learning. Lots of people think Chiquimundo means something like cheeky monkeys so we’ve embraced that and worked it into a cute way to set the stage for successful language learning. 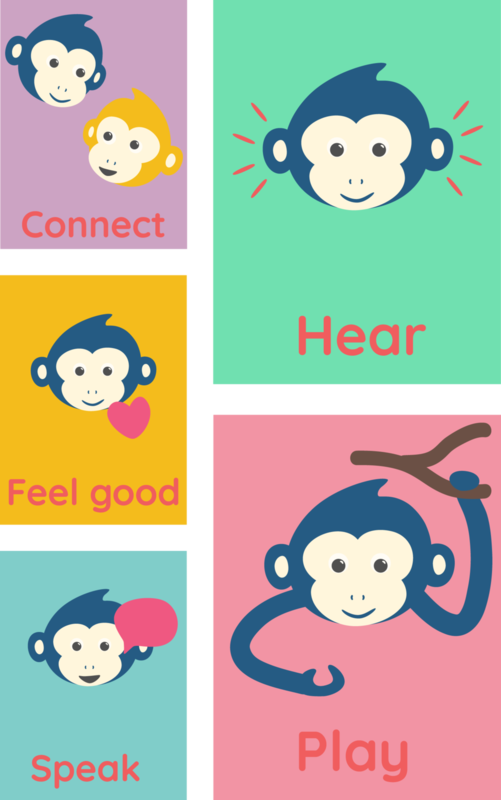 Our 5 cheeky monkeys demonstrate our wide range of programmes that allow for families to HEAR, SPEAK, PLAY, CONNECT and FEEL GOOD about learning Spanish. When all of these principles combine, you are set up for successful learning! We thank you for visiting our page and hope to welcome you into our diverse, fun-filled community soon. If you have further questions or want to know more about how learning Spanish might work for you, please get in touch.